Blakey stopped by to visit this afternoon. We traded notes on group 82 and the Road Switch and life in America and the Virgin Mary and Supy and all. Good times all around. The apparition of the Virgin Mary is the most popular subject on the blog to date. The previous record was set recently by the Miss Samoa pageant. Mary garnered more than twice the hits Jacinta and Ms. Australia got. Hats off to her. One might think the late night class is the worst, but I find the 8:00 – 9:00 and 9:00 – 10:00 classes more disruptive. I feel like the later part of the evening (i.e. watching TV and reading) is more variable and extra-curricular than the mid-evening activities (i.e. dinner and blogging). Group 79’s Close of Service conference is this weekend. It is bittersweet. On one hand, they’re only a year ahead of us, and it’s exciting to think we’re getting pretty far into our service. On the other hand, I like group 79, and it’s sad to picture this place without them. You’ve got big shoes to fill, 82. Preparations for White Sunday have already begun at Mulivae. 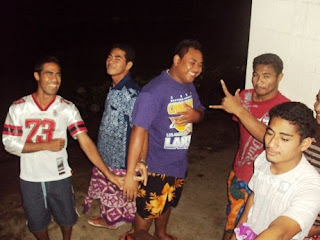 White Sunday was our first Samoan holiday last year, so this will be the first time we’ll be able to compare things to last year. It should be thrilling. I’ve eaten pumpkin stir-fry the last four nights in a row. Tonight’s menu: pumpkin stir-fry. Last night in the middle of class, some students brought me a cup of tea and a plate of panepopo, sweet bread sated with coconut cream. It was delicious. I offered some to my kids, and I was a bit surprised when they accepted the offer. Although looking back now, I don’t know why I thought they wouldn’t. The Otter Pop. For the Union City 40th Anniversary parade in 1999 I was an otter pop, the most popular item at the public pool’s snack bar. My mom made the costume for me, and it was a big hit in the parade. Parents made children take their picture standing next to me. The Creedance Tape. Though I’ve never been to a Lebowski Fest, I often think about what my costume would be. My friend Chris from USC told me someone once won the contest by dressing as the CCR tape that was in The Dude’s car when it was stolen. Brilliant for its tangibility and obscurity. The Street Vendor. For last year’s Halloween Party, Aaron 80 attended as one of the street vendors in Apia who approach tourists to hawk lavalavas and playing cards and other things. My favorite part of the story is he bought all the stuff from a single vendor. Apparently when he asked to buy all of the merchandise, it really creeped out the vendor. I was laying in bed about to go to sleep last night when I somehow scratched my eye. At first I thought I had an eyelash trapped under my eyelid, but after repeated attempts to sweep it out, I decided I had somehow scratched my cornea. It seems to be getting better. We’ll see how it goes avoiding infection. Cross your fingers. The scheduling meeting for the year 13 camp. 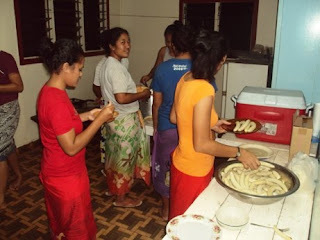 Girls preparing fa'i, bananas, for dinner. 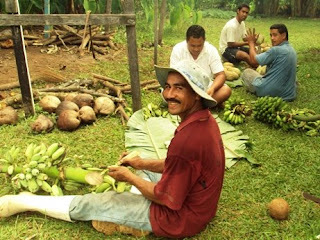 Guys peeling fa'i and peeling ulu, breadfruit. Apong brought this pepper from India. 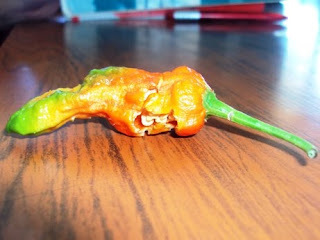 He claims it to be the spiciest pepper in the world, and I'm inclined to believe him. He showed it to me in a small Ziploc bag. He opened it and told me to take a whiff. Yeah. My nasal membranes had a little cry. When I asked to take a picture, he maneuvered the plastic bag so as to get it out (and scoop it back in afterwards) without letting it get near his fingers. I didn't get the name of the pepper. I'll look into it. Love reading your blog. My husband and I returned from Samoa last week after 2 weeks taking in Teuila and the first week of the switch and we are having massive (Samoa) withdrawals. Reading your blog is prolonging our holiday memories especially as you live just down the road from where we stayed (Aggies). Love you entertaining writing style. Keep it up. Who made the Otter Pop costume?!? Not me, I think it was you! It's still here in your room, but I think the felt and plastic would be a little uncomfortable in the Samoan heat and humidity. Hey Matt. Just wanted to say that I thoroughly enjoy reading your blog. I was also in Samoa for the latter end of the teuila festival & witnessed the road switch and the Miss Samoa pageant amongst other things. 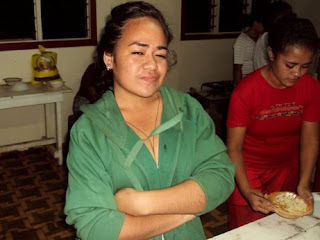 Your experiences in Samoa & insight into the culture is amazing and I truly do envy you for residing in such a beautiful place. Love your work and the photos! Hope Samoa is treating you well. That pepper from India? Looks like the custom people at Faleolo screwed up. 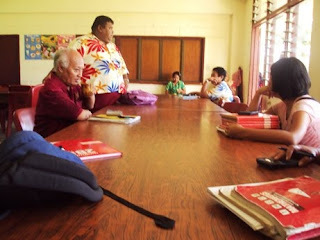 People are not supposed to bring those things in to Samoa. Can you see those stupid things growing all over the country......and it looks retarded!! !